For the ganache, I used honey instead of corn syrup as the invert sugar even though the rules exempt the frostings from the requirement that at least 1/4 of the sweetener be honey. I thought it would round out the flavor nicely. And the black walnuts are some of my foraged stash. They smell so lovely when they're chopped and I think the stronger flavor of the black walnuts stands out against this very dense cake. Here's the bread from yesterday as well. I took the one that I salvaged mid-bake so it wouldn't have parchment stuck to it and entered it. I will find out in two days how my canned goods and these baked goods did and will report back! Now is the time to dig out the fridge. And it's a good day for it as there is a sidewalk repair going on across the street and it's hard to get in and out of the driveway. Because of the excavator. With all the accumulated farm share veggies I made a triple batch of eggplant caponata (9 jars) and a full batch of hot pepper sauce (also 9 jars). I had to run to the store to get more jars. Also today, I baked the bread and cake with honey that I plan to enter in the fair. I have to bring those up tomorrow to Topsfield. I was hoping to do that tonight but my husband and I are going to a lecture downtown and so I made time to drive up there tomorrow. 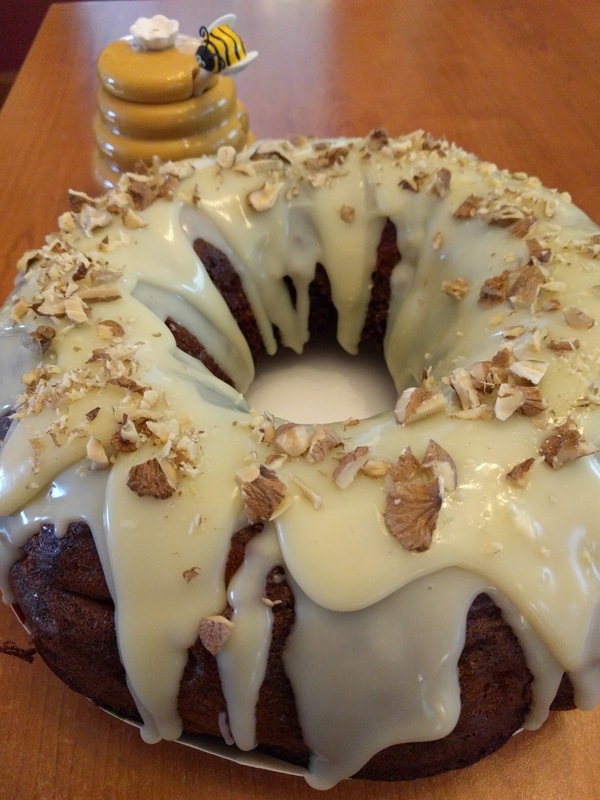 The bread is the same whole wheat bread recipe I've been using with Legion and the cake is the honey lemon almond pound cake I came up with when I was in school. I'll top that with a lemon ganache and black walnuts. Tomorrow morning. Early. I don't think I'll have time to do that tonight. There was a bit of a crisis with the bread, though. The parchment paper I bought recently is *ahem* not of the best quality and STUCK to the bread. What a disaster! 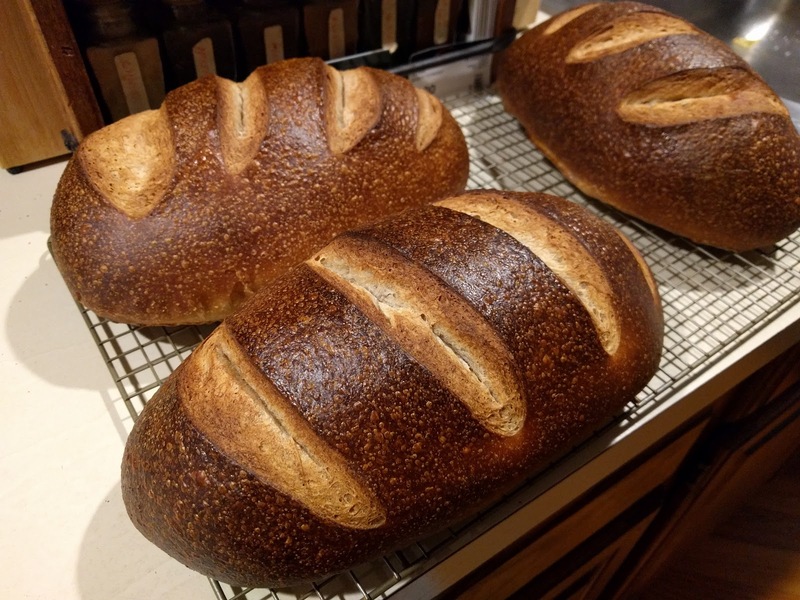 When I discovered the problem, the other loaf was in the oven so halfway through the baking process I had to get it off the bad parchment and onto another baking sheet lined with better parchment. This seems to have worked and I have one loaf without any stuck-on parchment to enter. I did go back to Amazon and write a truthful review of the parchment paper. I will never buy that again! Anyway, I amassed enough tomatillos to make a quick half-batch of salsa verde again, so I popped everything under the broiler for about 8 minutes and then used the immersion blender to purée it all into a salsa. This made 3 cups of salsa. The tomatoes are done for the season they say, so I got a quart of sungolds for nibbling and 3 large tomatoes which will go into my freezer stash for sauce. Also in the share: 2 delicata squashes, 1 watermelon, 2 leeks, a bunch of scallions, 3 eggplant, 4 sweet peppers, 8 onions, as many hot peppers as I wanted (I only took the 4 serranos I needed for the salsa), 1 cup of raspberries, a bunch of beets, and some things I didn't take (flowers, green beans, Shishito peppers, husk cherries, other herbs). For dinner tonight I'll serve the potatoes from last week's share roasted with scallions and a salad as sides for our baked chicken dish. As always, I am thinking ahead to November when the farm shuts down for the winter and we will miss all these fresh vegetables. Last night was my canning class at the culinary school. As you can see from the title, there are things I could have done better! But I'm getting ahead of myself. There were six students, my assistant and me. I had planned that each student would make a savory/vegetable thing, either a pickle or a chutney, and each would make a sweet thing. My assistant also made applesauce for us to can as a demo. However, it wasn't ready in time and one student's pickle was ready first so we sort of demo'd on that. What we discovered was that while four canning pots was likely enough, there were not enough burners left for everyone to cook at a reasonable pace. The class ran way over time, by about an hour! One person had to leave early because her ride couldn't wait any longer. I felt bad, as she didn't even get to take home the jam she made. She did get a nice collection of other things to bring home. Certain recipes worked great in that time frame, like dilled carrots and dill pickles, but the bread and butter pickles took way too long. If I were to do this again, I'd get the cucumbers and onions set up ahead of time. So, lessons for next time: cap the class at six students and do fewer recipes but spend more time talking about them. Also, demonstrating the food mill is unnecessary. If the school wants me to teach it again, I'd be more than happy to! Here, on the first day of fall, I'm processing apples. I have another three quarts of applesauce in the canner. Also, I baked an apple cake. I still have at least a peck of apples left to work through and I haven't made a pie yet so that's probably next on the agenda. Meanwhile, my canning class will be happening on Monday and I'm just working on the last minute details with the director. So far I have five students signed up, and there may be one or two more who enroll before the class begins. It's just a one-time class but if people like it I may do it again. Also today: the bees got fed. They seem to be going through jars of syrup every four days. I think I'll get one more feeding in before I'm supposed to take out the feeder and stop for the season. The smoker is making this a much more reliably pleasant experience. While I loved going in and out of the hive last summer without my gear, I was definitely unrealistic about the potential for a bad experience. Now that I know more about beekeeping I am keeping the gear on. Whether or not we were going apple picking was undecided up until the time we actually showed up at the orchard and it had stopped raining long enough for people to pick. The weather was being rather unpredictable. Regardless, with a friend in addition to the family, we filled our bag with Honeycrisps, Galas, Fujis and Macs. And then filled our stomachs with cider donuts and cider slushies. Mmm. After a lunch with my parents, we came home and I started cooking. First I used up all my eggplant and tomatoes by making a double batch of eggplant caponata and a single quart of whole tomatoes (26 small, maybe Jolly, tomatoes). Then we ate dinner and it was time to make applesauce. I probably cooked about a half-peck of apples, maybe a little more. It was all the Macintoshes and some of the Galas, I think. The Macintoshes cooked down so well and the Galas didn't that after I ran it all through the food mill, I cooked down the peels again to get the rest of the apple bits out. To the resulting applesauce, just over three quarts, I added about two cups of sugar. These were processed for 20 minutes and then rested for 5 before being removed. I'm sure I will be making more! Tonight, after watching our annual Town Day fireworks, I popped a quick batch of salsa verde in the canner. I'm finding that if I roast the vegetables under the broiler for about 8 minutes then it takes no time at all to make the salsa. I put the liquids and spices in the immersion blender's container and then add the roasted veggies and blend away. Tonight's batch started with six tomatillos, one onion, two cloves garlic, two serrano peppers and one jalapeño pepper. Now all the hot peppers I have left from the farm are the Hungarian Hot Wax peppers and I can make another batch of hot sauce with them. At the farm yesterday we could take "as much as we wanted" of the regular or plum tomatoes on the vine. I decided to try my hand at making spaghetti sauce and so picked every ripe plum tomato (Roma) that I could find. I brought home 22. Sorry to those of you who were looking for some! Tonight after dinner I peeled and seeded them, then made the Italian-Style Tomato Sauce recipe in the Ball Complete Book of Home Preserving (page 365). I made 1.5 times the recipe as I had more tomatoes than the recipe called for, but ended up only getting a little bit more than the expected yield from the original recipe. Currently they are in the canner for 35 minutes and then when that is done I will go to bed. While I don't think this is exactly what I planned when I wanted to make "spaghetti sauce," it'll do nicely as a base for a quick cacciatore or meat sauce. The farm share is full of hot peppers these days and I brought home another 20 peppers: three cherry bombs and seventeen Hungarian hot wax peppers. These, plus seven or eight habaneros went into another batch of hot sauce. I can smell the heat from the peppers from the other side of the house. A little taste was more than enough! It spattered on me and gave me a little burn, but I'm not sure if it's a thermal burn or from the capsaicin! I also brought home a huge bowlful of plum tomatoes and will try to make spaghetti sauce sometime soon. I've not done that before and I think it might be fun. I probably won't get very much since I don't think I'm starting with 20 pounds of tomatoes, but I can at least make some. Whether or not I can it is a different story. One of the few plants that did well this year were elderberries. In the spring the large puffy white flower heads were visible everywhere I looked. I tried to remember where I saw them so I could find the berries at this time of year. My usual spot didn't look so good today, perhaps due to having done so well last year, so I went to a different spot and got a good amount of berries. The most tedious part of foraging has to be the cleaning and prepping of the food and elderberries are tops in tedium. It took me probably 90 minutes to get all the berries off the stems. After that, though, extracting the juice and making a batch of jelly took no time at all. For today's jelly: 4 cups elderberry juice, 1/4 cup lemon juice, 5 1/2 cups sugar and one package of powdered pectin. This makes almost exactly 7 cups of jelly. Now I have a dilemma: I have entered the "other jelly" class in the fair, and I have both elderberry and rose hip jellies. I think tonight there will be a taste test to determine which one I should enter (I can only enter once per class). The tail end of Tropical Storm Hermine has finally arrived in our area and we are getting some much-needed rain. Indoors, I had the last four cups of rose hip juice waiting to be turned into jelly. First, though, I needed jars. Before that, I had to take the car into the shop for service. Having done all that and getting a rental for however long that takes, I got home and started working on the jelly. 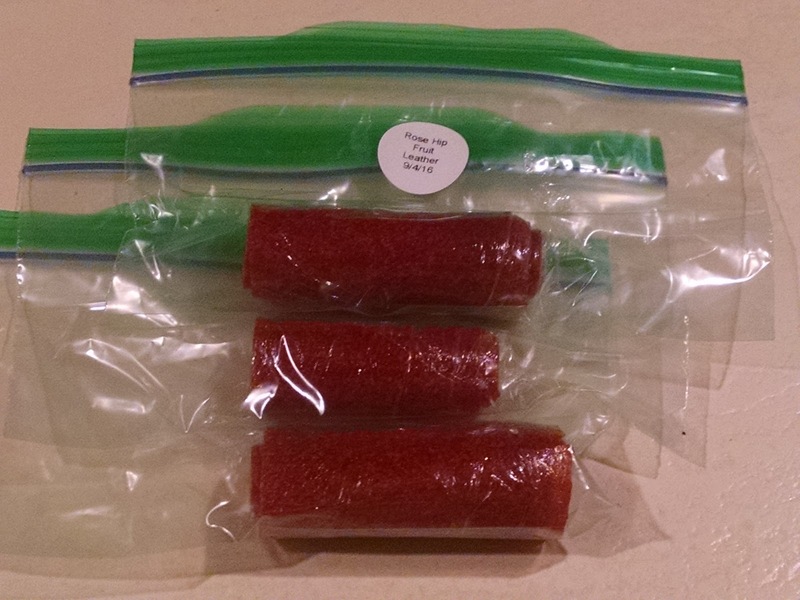 Same recipe as before: 4 cups juice, 1/2 cup lemon juice, 5 cups sugar, 1 package powdered pectin. As this is being added to the gift stash, I am using 4-oz jars. The recipe made enough to fill 12 jars, one whole flat, plus a little extra for us. This brings the gift stash up to 42 jars. That's excellent! Now I have my eyes out for elderberries. I drove by the place I usually get them but they didn't seem as plentiful this year. I have a few other options I will check out in the next day or so. After I extracted all the juice from the rose hips I ran them through the food mill and was left with a bright orange pulp. To this I added about two cups of sugar and then spread it out on saran-lined baking sheets. I don't have a dehydrator so I put them in the oven on warm overnight. The following morning, one of the two leathers was ready but the other one was too thick so took an extra day. With each one, I cut the leather into eight equal pieces and left the saran on the one side. Then I could roll them up and put them in single serving bags and they wouldn't stick to themselves. We ate one and it was so tasty and the perfect texture. Perhaps if I had a dehydrator it would be easier but I would rather just get a new oven with a dehydrator mode. For now, this works. Every few years I get a chance to drive up to my (now former) boss's house and borrow his driveway. He lives near a beautiful beach just teeming with beach roses and this time of year the rose hips are ripe. A few days ago he sent me a photo so I could tell how they were doing and it was certainly time to get them if I had time to get over there. So my husband and I made a day of it with the 11-year-old. 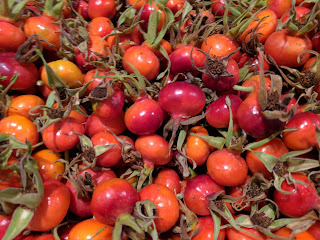 We drove up, walked along the beach, watched the sandpipers, skipped stones (well, tried to), and collected rose hips. After that we drove up to Woodman's of Essex and tried out their fried clams. They're very very good. I am going to have to go back up to the Clam Box so I can compare while these ones are still relatively forefront in my mind! When we got home I washed and trimmed all those rose hips and simmered them. I turned off the stove and left them in the pot while we went to see a movie and when I got back I was able to quickly extract 4 cups of juice to make jelly: 4 cups rose hip juice, 1/2 cup lemon juice, 1 box of powdered pectin and 5 cups of sugar. Two of the jars are slated for the fair (making a total of 10 canning entries) and the rest will be for us and the gift stash. As an aside, the movie we went to see was Kubo and the Two Strings. Truly the most stunning animation I've seen in a while and the story was beautifully told. I highly recommend it if you get the chance! There is still another 4 cups of rose hip juice and a whole lot of pulp. I'm going to run the pulp through the food mill and see what I can do with it. 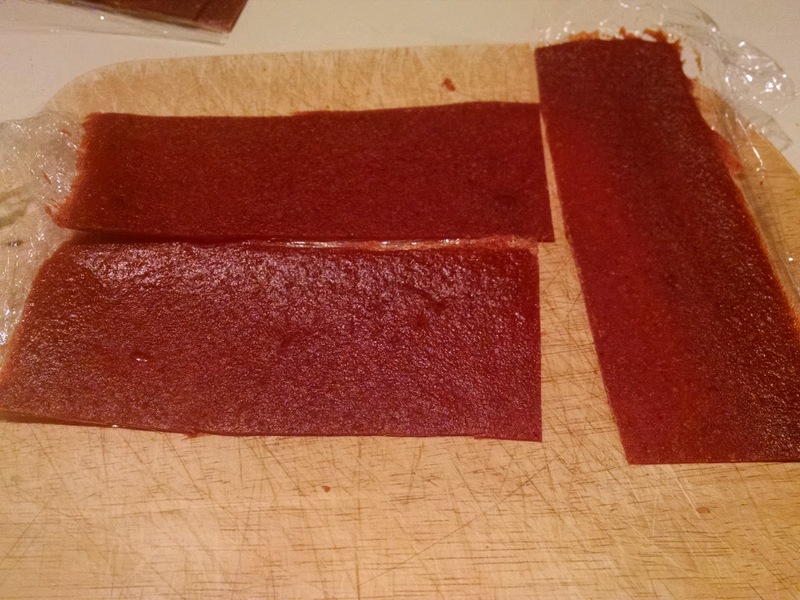 I have read it makes a tasty fruit leather. My new smoker arrived in the mail yesterday and I needed to change the feeder. After checking in with our next door neighbor about when would be a good time (meaning, their kids were in for the night) I got the smoker, a jar of syrup, my new (not red) bee suit and all the rest of the necessary gear ready. I even got the mouse-guard figuring I should replace it while I have a chance. What a pleasant and easy experience that was! Even when I dropped a screw for the mouse-guard and had to go back in the house for another. By the time I did that, I didn't have the gloves or veil on anymore but the bees were once again fine with me working around them without it. The smoker burned through it's fuel very quickly and was cold by the time I was ready to go inside. How wonderful is that? After this, the next jars of syrup will be 2:1 (2 pounds sugar to 1 pint water) and I'm to keep their food at that ratio until it's time to stop feeding them, in one month. Then I'll get their fondant boards ready for sealing up the hive in November. It's hard to think of cold weather right now but, for the first time in a while, the weather has been pleasant. Yesterday I made a batch of tomato salsa which yielded four pints. I'd hoped to make a batch of caponata yesterday as well but I was just too tired and ran out of time. So I made it this evening. However, not all of it was canned. As I was cooking chicken tortellini for dinner I thought that the caponata would make an excellent sauce. Turns out, I was right! However, as the youngerchild doesn't really like eggplant I also made a quick Alfredo sauce which worked well. What was left of the caponata was canned into two pint sized jars, one 12-oz jar and one 4-oz jar. My gift stash (all the 4-oz jars) is now up to 28 jars.